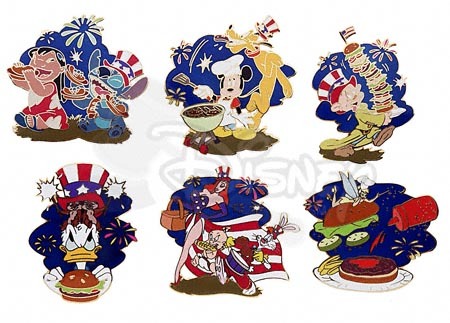 The 4th of July BBQ Set included six pins with various characters enjoying a holiday bar-b-que. Jessica, Baby Herman and Roger Rabbit recreate the "Spirit of '76" painting. 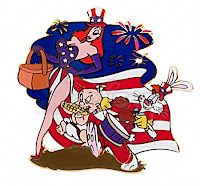 Jessica Rabbit is wearing an American Flag dress - with white stars on her blue top, blue gloves and red and white striped long, flowing dress. She's also wearing a top hat and holding a picnic basket. Baby Herman is eating an ear of corn, and Roger is holding chicken legs as drum sticks. The background is a clear dark blue fill with fireworks in the sky. 25 of each pin from the set were auctioned separately, the remaining 75 were auctioned together as the full set. These pins were also made in one-of-a-kind artist proof pins in silver, black and gold metal. 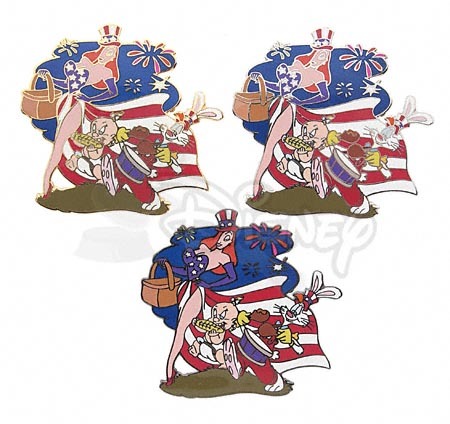 Disney also began to heavily feature these pins in their marketing, emails and home page.